Qualcomm is looking to tackle some of the issues with Bluetooth audio with its new aptX Adaptive codec. Its key feature is that it dynamically adjusts to what you're consuming, which should not only improve audio quality overall, but also reduce latency in A/V content like videos and games. We all know that Bluetooth audio can be spotty and disappointing (especially when compared to wired), which is a bummer since more smartphone manufacturers are doing away with the headphone jack. Qualcomm is saying that it "replace[d] the wire" with a dynamically adjustable, low-bitrate (24-bit 48KHz), scalable, and (potentially) low latency codec: aptX Adaptive. So what does that mean for you and me? Qualcomm says it's aiming for the "just works" sort of experience, meaning that things will automatically adjust to whatever you're doing, whether it's listening to music, talking on the phone, playing a game, or watching something. aptX Adaptive is even supposed to function well in noisy radio frequency (RF) environments, thanks to bit-error resilience. 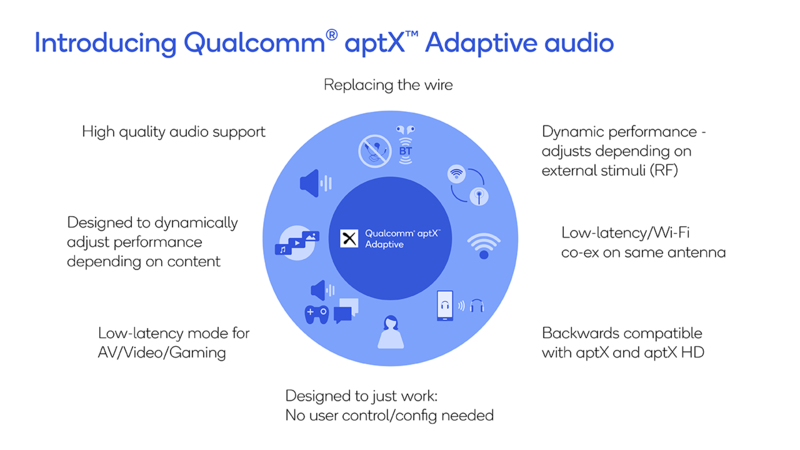 From the sounds of it, Qualcomm thinks it has saved Bluetooth audio, since it claims that aptX Adaptive offers hi-res sound quality that is "indistinguishable from CD." 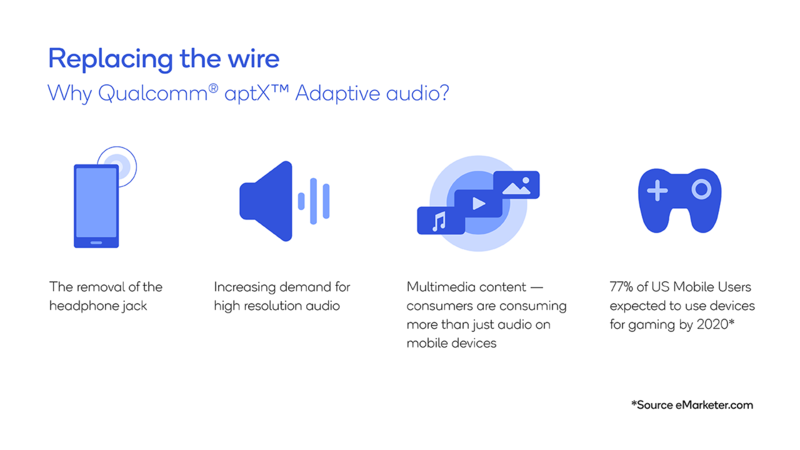 That remains to be seen, but the company says that aptX Adaptive will be backwards-compatible with aptX and aptX HD devices. We can expect to see things like headphones and speakers with the aptX Adaptive decoder sometime after this month — rather, the new CSRA68100 and QCC5100 Bluetooth SoCs will be available to partners after September. The encoder will apparently run on phones and tablets with Android Pie after December, though that timeline may be subject to change.